Who doesn’t love a fairy garden? 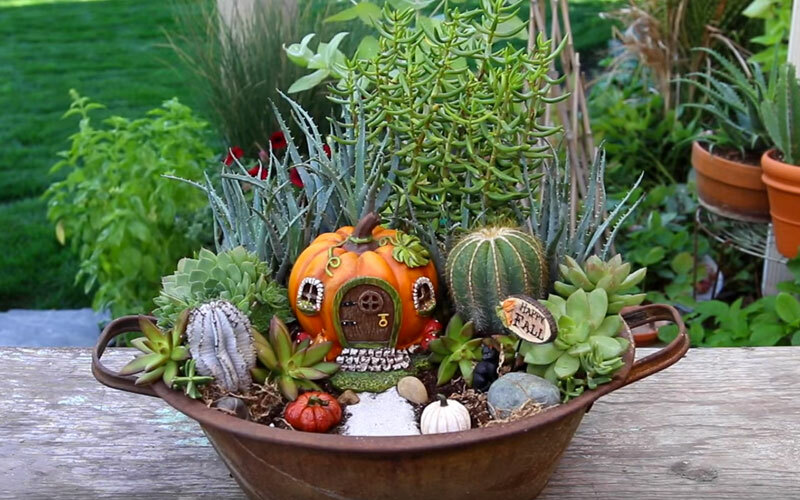 In this video, courtesy of Garden Answer, you’ll quickly see how easy it is to make an Autumn fairy garden of your very own. Use a wide potting bowl or any interesting piece that you can fill with potting soil and plants. Just make sure you have plenty of space to work with and use soil that’s appropriate for your plants. Pick a centerpiece that will serve as your fairies’ home, and surround it with low maintenance succulents of varied colors and textures. It’s like creating your own miniature forest. If you lived in this fairy garden, what would you want it to look like? “Build” a tiny walkway from the door of your fairy home using sand or small pebbles. Add a little decor with fairy-sized pumpkins and a sign that welcomes Fall. You can even place some moss here and there to create more texture and warmth. Your imagination is the limit! Watch this video for tips, recommended plants, and ideas to make your tiny garden any fairy’s dream home.